This looks like a book I would COMPLETELY avoid. Not only does it depict a woman in a traditional wedding gown and two little children following behind... but has a beautiful scenic view. Yeah, not for me at all. However, the cover of the girl amongst the shadows... now that is intriguing. After reading the book, the paperback cover definitely does justice to the book that the hardcover took away from. I don't want to focus on this, since it's been mentioned by a bunch of people reviewing this book, but I did have to speak my peace. 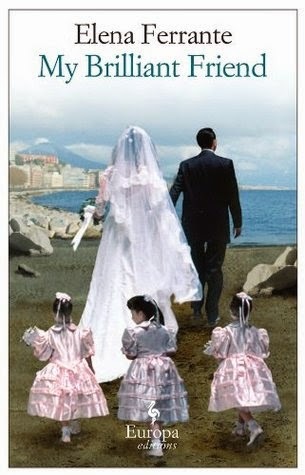 Getting back to this epic Italian literary tale, I was completely ensnared into the lives of Elena and Lila. At first I thought this was going to be a cautionary tale of how careful you have to be picking friends, but while this might be a lesson early on, the story takes a bigger look at friendship. Part of the charm is the setting, Italy. 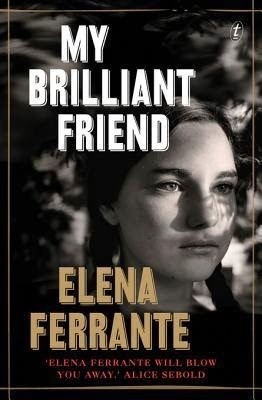 When I think of Italy I see romance, gondolas, high fashion and great food (I have to admit that I've traveled to Italy a few times) but My Brilliant Friend gives you a sneak peek at a different Italy, one with rags, struggle, traditions and epic family battles. I've heard and experienced the powerful Italian personalities, but this book really brings it to light. All of the characters speak their mind, swearing at one another, professing love, throwing themselves into romance and passion. Who wouldn't want to read that? I have to apologize though, I might be mixing my feelings for the second book in the series with this one. Right after this book ends (on a cliffhanger), I picked up the next one and started reading it that same night (no sleep for the addicted reader). This novel follows the girls early childhood years, which is a great set-up but lacks the relatability with my current feelings and situations. I did connect with a few nostalgic childhood references but overall the charm was held within the differences. I loved experiencing and learning about the Italian traditions, the struggle the lower class Italians had to overcome was eye opening, from the challenges of keeping up good grades to remain in school to learning your work trade passed down from the family (giving you no room to create your own future). This book is very unique, I'm not very fond of being sucked into a series, my "too little books, too little time" motto gets in the way. However, this is a series that I don't regret starting and will eagerly anticipate the next one.